Destroyed buildings line a street – which is flooded with algae-covered, debris-filled water – in the Old City area of Homs, the capital of Homs Governorate, Syria. The Special Envoy, Staffan de Mistura, said “the UN's clear goal is to reach, as soon as possible, a nationwide ceasefire,” Deputy UN Spokesperson Farhan Haq told the regular press briefing at UN Headquarters today. Meanwhile, “initiatives like this one bring relief to besieged or isolated communities and have great value,” Mr. Haq quoted the envoy as saying. “They help the perception that a nationwide ceasefire brokered by the members of the International Syria Support Group is doable and that the UN can and will do its part.” Technical preparatory talks for the next International Syria Support Group meeting are taking place today in Geneva, Switzerland. The evacuation operation from Homs was carried out on Wednesday when a UN team and its partners moved about 700 people, including 30 wounded, from the Al Waer neighbourhood and transferred to Idlib governorate, as stipulated in a local ceasefire agreement. The spokesperson said the evacuation, in addition to the previous entry of humanitarian assistance on 5 December, made a significant change in the lives of more than 60,000 people with limited access to such assistance living inside Al Waer and the wider geographic area of Homs, one of the most heavily damaged cities in the Syrian war that erupted in 2011. Also today, the Geneva-based UN refugee agency reported that the first group of 163 Syrian refugees had arrived to Canada as part of the recently announced humanitarian initiative which would provide a new life for 25,000 Syrian refugees. As the situation in Syria continued to deteriorate with many falling below the poverty line, the Office of the UN High Commissioner for Refugees (UNHCR) urged other countries to engage in similar programmes, in addition to the 30 that had pledged more than 160,000 places for Syrian refugees under resettlement and humanitarian admission schemes to date. It is estimated that 10 per cent of the 4.1 million registered refugees in countries neighbouring Syria were vulnerable and in need of resettlement or humanitarian admission to a third country. In related news, the UN Office for the Coordination of Humanitarian Affairs (OCHA) announced that the Under-Secretary-General for Humanitarian Affairs and the UN Emergency Relief Coordinator, Stephen O'Brien, would visit Syria from 12 to 14 December. Mr. O'Brien would see for himself the situation on the ground and the activities of the United Nations agencies, and would try to refocus the world's attention on the 13,500 million people inside Syria who were in desperate need of aid and protection. 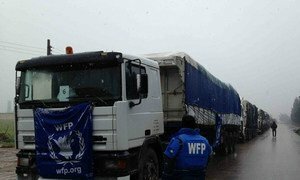 As the fifth winter of this conflict gets underway, more than 13.5 million people need basic aid and protection. They face daily deprivation and brutality. Four out of five Syrian families now live in poverty, and millions do not have enough food, clean water or shelter. Also on Syria, the agreement between the United Nations and the Syrian Government concerning the Status of the OPCW-UN Joint Investigative Mechanism was signed in New York this morning. With that agreement, the Syrian Government agreed to provide support to the Mechanism to conduct its activities in accordance with Security Council resolution 2235 (2015). The Mechanism's mandate is to identify to the greatest extent feasible individuals, entities, groups or governments who were perpetrators, organisers, sponsors or otherwise involved in the use of chemicals as weapons, including chlorine or any other toxic chemical, in the Syria as determined by the Organisation for the Prohibition of Chemical Weapons' (OPCW) Fact Finding Missions. At the same time, the UN Secretary-General Ban Ki-moon announced the Joint Investigative Mechanism to be fully operational on 13 November, and its first report is expected sometime in February 2016. "The Secretary-General commends Saudi Arabia for its constructive efforts and leadership in convening the Syrian opposition conference in Riyadh, between 9-10 December," said a statement issued by his spokesperson in New York. Mr. Ban also highlighted the importance of "maintaining the positive momentum" of the efforts of the International Syrian Support Group (ISSG), allowing it to move forward and launch a credible political negotiations among Syrians in January to implement the 2012 Geneva Communique and the ISSG Vienna statements. Against the backdrop of devastating attacks on health facilities resulting in the deaths of countless health workers along with their patients in Syria, UN Assistant Secretary-General for Humanitarian Affairs Kyung-wha Kang today called for greater protection and assistance for Syrians caught up in the country’s four-year conflict.